We usually get at least 20 pounds of blueberries during the season. Which means I will be baking…a lot. Cobblers, pies, muffins, crumbles, and cakes (oh my!). Only problem is my family and I don’t like eating too much sweets all the time. I have to get creative. Raw, vegan, gluten-free– you name it I’ll try it! Chia eggs are the best–you can turn any recipe vegan by replacing the eggs with this quick trick! Chia seeds are known for their powerful health benefits. They’re loaded antioxidants, fiber, quality protein, Omega-3’s, and more! They’re great for energy and weight loss. Plus, they’re easy to add to just about everything. Blueberries are amazing for you too! I found this article on Thrive Cuisine to be very informative on the many health benefits of berries. 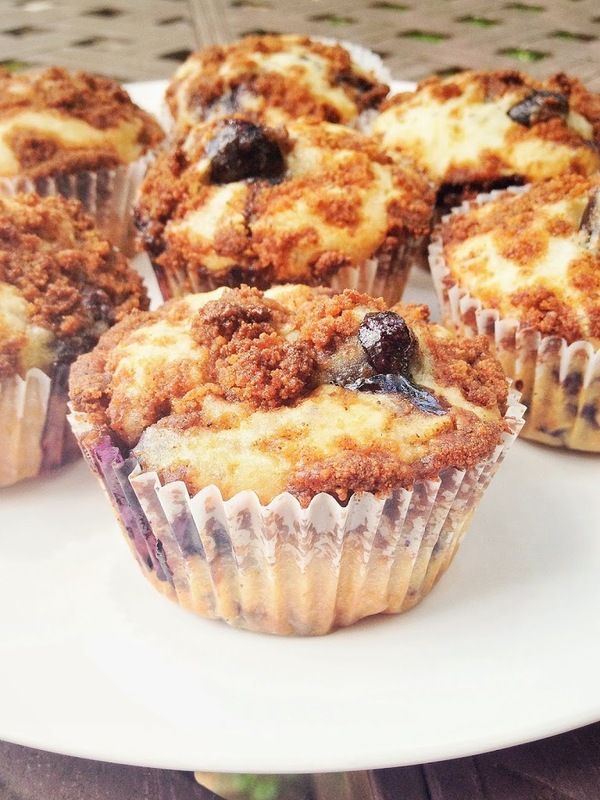 Deliciously moist with plump, sweet blueberries and a touch of cinnamon flavor, these Vegan Blueberry Chia Muffins are healthy and delicious for every time of the day! Preheat the oven to 400 degrees F and line a muffin pan or grease with coconut oil. First, make the chia egg. Mix one tablespoon of chia seeds with three tablespoons of water and refrigerate for 15 minutes. Mixture should be thick and egg-like. If it’s too thick, add another tablespoon of water. Combine flour with the baking powder in a large bowl. Make a well in the center and add the maple syrup and vanilla. Do not mix. Place 1/3 cup melted coconut oil into a 1 cup measuring cup– add the chia egg and then enough almond milk to fill the cup. Pour in the center of the flour mixture and mix well. Fold in the blueberries and 1/2 tablespoon of chia seeds. Let rest for a couple minutes while you make the crumb topping. To make the crumble, mix coconut sugar with coconut oil and cinnamon. If the mixture is too “dry”, add more oil. If it’s too “wet”, add more coconut sugar. It should be crumbly. Fill muffin cups almost to the top, and sprinkle with crumb topping mixture. Bake for 15 minutes, or until toothpick comes out dry. What is your favorite blueberry baked good? These look SO delicious! Can’t wait to try them, I love blueberries! Thank you very much, Kristina! Classic, indeed. I can have blueberry pancakes anytime. With ice cream, of course. 😉 Thanks for stopping by my blog! These muffins were amazing!!! I used blackberries instead of blueberries because that’s what I had and they were outstanding!!! Thanks so much for trying them, Danielle! Yum, blackberries sound amazing. Lol, love the hashtag. These muffins were amazing! I used whole wheat pastry flour and decreased the maple syrup to 1/2 cup. Great flavour and very moist. These were baked for me by a neighbor, ….we loved them! The crunchie top was great! Will be baking them myself! Hi Suzie! I am so happy to hear you enjoyed these muffins. The topping is my favorite part as well. 😉 Thanks so much for stopping by! I was wondering if it would be okay to use regular milk instead of almond milk. I am not a vegan so i do not mind. 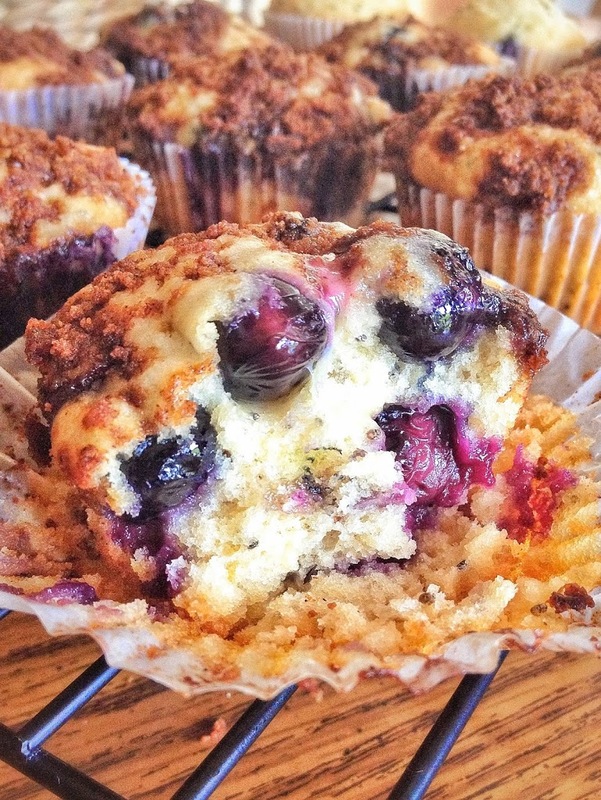 I just made these muffins, and they were fantastic! I substituted banana for the coconut oil, and added a little lemon zest and lemon juice, and omitted the cinnamon topping. This page has adware/malware, keep getting redirected to a new page saying my device is infected.